Last month of May was the fifth year of our Tubbataha 2011, but until now it still bring a lot of fond memories. Reminiscing and scribbling once more those wonderful moments….. If you are a Filipino diver, chances are you have cruised to Sulu seas towards Cagayancillo, Palawan for the only UNESCO marine heritage site in Asia – the Tubbataha Reef National Park. If you love the marine world, this is your place and you will never get disappointed. Most often, works and beauty of nature are beyond the surface and it can only be revealed to curious spirits who choose to tread afar for a paradise quest. Diving in the Tubbataha Reefs was a dream come true, the four-day expedition was total immersion in this hidden paradise. What about having four dives in a day? It was really wet! The richness and diversity of the park is hard to equal – from bobbies to sharks! Not to mention turquoise waters, azure skies and vast open horizons decorated with sunrise and sunsets. There was stillness and serenity. My thirteen dives were filled with great sightings and here is my account for what I encounter in different spots in the park. A wall dive decorated with active fish life, then with a sandy slope to the wreck. It is the home of white tips and gray reef and giant trevallies. We sighted two white tips perching on white sand as if sleeping, so with gray reef in different locations. There were triggers, large snappers, groupers, sweetlips, napoleon wrasses and breams. There was a turtle, a school of barracuda, moray eel with a remora, fusiliers and emperors and there was lot more I couldn’t name them all. Of course, I didn’t miss the large gorgonians in lavender, yellow and green. The small shipwreck here was also an attraction, I love wrecks and my last of the three dives here had a safety stop going around searching every corner of the wreck! variety of colorful sea fans and soft corals. You must be careful not to bump with the sharks! This is located in the southwest of the North Atoll with a breathtaking wall decorated with large gorgonians and variety of colorful corals. Sharks are again often seen here, we found more than ten swimming coyly. 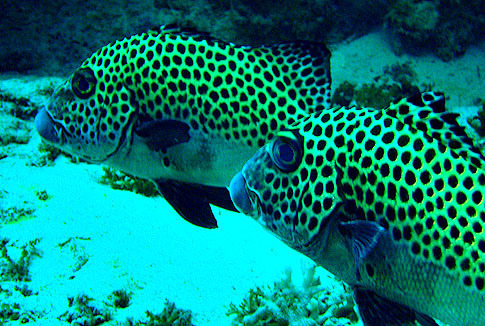 Other species are sweet lips, groupers, trigger fish, large parrots, giant moray eel, boxfish and puffers. It was already late afternoon almost a night dive when we descend here. Large groupers, sweet lips, snappers were the common residents. Variety of sea cucumbers like ananas and leopards were sighted here. I found more fish life here than the seafans.Like snappers, triggers, wrasses, parrots surgeons, emperors, angels and pufferfish. Sighted here at least two turtles swimming coyly before us. 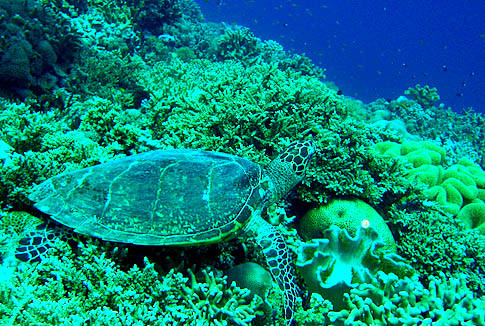 This dive site is also located in North Atoll, is one of the best places for spotting a variety of marine life. Perhaps, it is a playground of white-tips, gray reefsand silver tip sharks as they abundantly swam in the area. We encountered a giant manta ray here! Or was it a devil ray? It was a real surprise! I could still vividly remember having a relaxed dive here waiting for some little surprise that day. Indeed, a whale shark about 5 meters trooping with white tips & gray reef sharks, giant tunas and trevally parading before us! And as if to emphasize its splendor, they made another round for all of us to watch. It was a real show! There were triggers, blue fin trevally, sea turtles and one of my favorite – a large school of jacks! Located in the South Atoll, the site features a large reef and a steep wall with another active marine life – black tips, gray reef, blue fin trevally, barracuda, moray eel, turtles to name a few. Anemones, sea fans, sea cucumbers and colorful hard & soft corals abound in this site. The excitement of getting into the waters and breathing deep down or discovering the unknown are just coating of this incessant aquatic adventures. It’s more about passion of the marine world, the life beyond the depths – just pure love for these creatures, admiring and watching in awe all these wondrous forms of life. You can’t help not to fall in love and feel grateful you had the chance to witness its splendor. My dive buddy and I agree it was worth for another visit. The great waterworld of Tubbataha is a piece of heaven on earth. The exhilaration of being surrounded by colorful fish of great variety is simply hard to equal. It was a very moving experience. While you’ve probably seen photos and videos on diving, you won’t understand what it’s really like or how it really felt until you’ve experienced it yourself. Tubbataha – where a brave and passionate diver’s dreams come true! Those “hitting two-birds with-one-stone” trips are the kind that I usually look forward to, I found it more productive and obviously it is time and money saving and with trip arrangements in place, all I need is to extend one more day to accommodate flying restrictions after diving. Being the gateway in the last Frontier, Puerto Princesa is impossible to be unknown and more than that, the city evolve in tourism as it cradled one of the seven new wonders in the world! And its being the greenest and perhaps cleanest city is not for nothing. My dive plans at the start of the year was clueless as other priorities that needs my immediate attention were at hand, but the week-long official trip in the city was just perfect. All previous visits in the city were too brief being just for stop-over to El Nido, Cuyo and Sulu Seas. After haggling for a slot for a Friday dive, they took me in and informed the diveshop as a caution that I was alone. Actually, the confirmation was last minute on Thursday, later I learned the water conditions was unfavorable. The big waves were uncontrollable and all water activities in the city were cancelled for safety reasons. So on that Friday morning, I took a trike though I knew the diveshop can be reached for a walk but I need to be early for the appointment. It turned out the driver was not familiar with the streets, how come? – such a pity. I was much earlier from the rest including our DM and after almost an hour of waiting, we all piled up in the multicab heading for Pristine White Beach. And again, we were a bunch, majority was foreign nationals! Although the sun was brightly shining, the waves were insurmountable. At the back of my mind, I trusted the DMs judgment, and we all piled up on the speedboat after assigning our buddies. We sped off riding on the big waves, spraying us with salt water like rain! Our first descent was in Crossing, the DM offered me to go down immediately thru the anchor line to avoid the surface turbulence, and wait until we go around down together. Indeed, it was more calm down but alas, the viz was hazy. It rang a bell in my mind, I must be careful not to get lost! Despite the blurred vision, I found active fish life. A parade of breams swimming coyly at a distance, there were variety of trigger fish but no titans! 😛 And there was a turtle! Our DM had to drag me to catch up but there was only blurry outline of the turtle swimming away. I think if not for the murky viz, I could have sighted more of the marine life. We surfaced after 52 minutes, my deepest at 19m still with 100 bars air. We sped off back to the beach for our surface interval, which is much better than stationed there with waves rocking our boat high and low. The Taiwanese couple begged off after the first dive. We stayed on the shallows biding our time, the waters was perfectly calm. With the sun shining and blue skies, it was a picturesque summer scene. As we prepared for our next descent in Maris Rock, I heard the friendly Canadian asking if it was safe with the big waves, and again I trusted the DMs judgment. We sped off holding fast for safety, I knew the waves were getting higher! The site has rock clumps scattered over white sands, the surface was still choppy so immediate descent was appropriate. The viz wasn’t any better, it was still foggy but thankfully there was no current. The fish life was much better, sighted giant puffer fish, clown fish, triggers, anthias and throng of juveniles over corals. We went slow and perhaps I was more observant in the second descent, even with the haze we found cleaner shrimp, some nudis and a small frogfish! We surface after 45 minutes, my deepest at 21 meter and with air still at 100 bars. The choppy water was heart pounding in a way, but it was another learning to my advantage. I believe the depths of Puerto Princesa has much in store even more in clear visibility. There were much more to see around the city – Mitra Ranch, The Bakers Hill, the Crocodile Farm, the famous Underground River , the island beaches in Honda Bay. The last two requires more time and getting a quick hop of the first three visibly offered more improvements compared a decade ago. Personally, I was more impressed what I saw in Iwahig Colony, it have transformed into an agricultural community with the detainees as workers and producers. The rice fields were maintained as well as the fresh water fishpond, other crops were also produced at the same time working with their handicrafts. It is a big boost for all the detainees inside Iwahig, aptly the facility is now called Iwahig Penal Farm. I thought there would be no hitting the grounds as I go through the transports heading home alone, the perennial flight delays almost created disaster in my connecting flight. I thought I wouldn’t make it, but I literally race for the gate as soon as I got my luggage from the carousel. It was miracle, my final flight towards home was accordingly delayed and in less than five minutes after I step on the area still catching my breath, the gate opened for boarding! And these are the kind of circumstances that prod travelers, which I correlate in diving as S R T A. A dose of adrenaline was in the rise. 🙂 Just the same, it was another miracle! This nudi (risbecia tyroni) is frequently found on pairs in single file, the slug at the back using its head to maintain contact with the one at the front. Tyron’s nudibranch as they are called have an ingenious defense system, just like other nudis they are fond of eating poisonous prey. 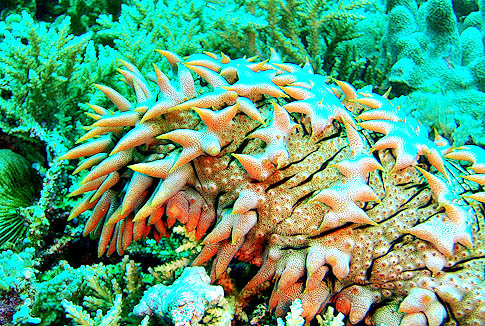 Indeed, one needs a keen eye to find them, they are silent and most often lurking on soft corals. We found this in the depths of Puerto Ptincesa, while the viz was far from good we caught sight of it in the yellowish reef almost hiding in the colors. But it was all alone, silently waiting perhaps for its prey. Have you encountered this nudi? For some time since I was hooked in the blue world, exploring a wreck has been a major highlight in my dive trips. Just as I love history, wrecks are akin to museums holding important artifacts, stories and information. What is more interesting is it is out there in the depths in silence, barely visited and untouched by human hands. I believe there are places meant for another visit, those kinds that you will never get tired coming over and over again. For me, Coron lured my inner senses more that its pieces of paradise on the surface – but the secrets in its depths! We explored almost all of the wrecks in Coron Bay, yet there are still reasons to be back in Calamianes. So, last October I took leave from work, booked tickets, packed my gears and head to Busuanga undaunted of the coming typhoon. Leaving office earlier than usual, taking things slow, having booked for the late night flight. I was alone in the shuttle heading for the airport, which I found comforting as I watch the night scenery on the road to Laguindingan silently. Even at past 10PM, the terminal was still teeming with people. The next morning was cloudy but not a deterrent for our exploring the quiet and laid-back side of Busuanga. Wrecks always thrilled me and I was hoping for discoveries again as I always expected. The port was just down the house garden over the steep pathway, our small boat was already waiting for us when we got there. We had a river cruise over the vast mangroves, the tranquil scenery was a good start as I remembered my childhood days in the Agusan River back home. Towards the river end to the open sea was the immaculate dive boat of Dugong Dive Center docked near a coastal community, we transferred, met our DM and finally headed for the bay. The other side of Luzon was greatly disturbed by a typhoon but our location was perfectly calm, the waters flat and mild breeze blowing. The only wreck in the area lies near an uninhabited Dimalanta Islet at the north coast of Busuanga, Kyokusan Maru which is a 136 meters cargo ship of the Japanese imperial army was like the others, it sunk in September 1944 now lying more than 70 years underwater. Other ships anchored in the area was believed to have remained afloat and managed to escape the raid of US troops. This wreck was sunk on the north side of Busuanga Island and, because of its distance to the other wrecks the Coron dive operations don’t make this trip very often. The wreck lists about 10° to starboard and has a compass bearing of 160°. Our first descent was at port of the wreck, going down to the mast at 16 meters now fully covered with corals, over the deck area and to cargo room. I barely noticed the fish life except for the giant bat fish that tried to get near us. You can still see the remains of trucks and cars in the cargo holds. The wreck is still almost intact and quite easy to penetrate. We found the fossilized truck, its chassis, and tires; we inspected also the machine gun platform fossilized and full decorated with corals. We went our deepest at 31.6 meters lingering over the deck area covered with corals. I have always loved the mystery and the stories behind this piece of history. Although I still wanted to linger, my 43 minutes was good enough considering the depth, I signaled for surface when my NDL went down to 2 minutes! Our surface interval was spent for our light lunch and hearing the stories of our DM. It was a relaxing break embracing the stillness of the surroundings. Our last descent was still at Kyokusan Maru exploring its bow end, as suggested by our DM taking advantage of the flat waters, going to another site could be with choppy conditions. They always recommend at least two dives in this wreck to cover at least major attractions, it depth can never allow longer bottom time. Going down again to the mast and went inside a hole in the right wall into some dark chambers. We lingered over the bow area all covered and fossilized with corals, some bivalves quickly snapped close as we passed. We sighted few nudis, puffers, chromis, damsels, anthias, crinoids and feather stars. We lingered until my NDL was down to 1 minute! I had forty minutes at 31.6 meters as deepest. 🙂 The two dives had been another discovery and learning opportunity, again it was a mind blowing experience. We had our river cruise again when we got back to our house. Diving on a WWII wreck helps us connect to our heritage and gain insight into our past. When our favorite diving environments host a piece of history, it’s our duty as a scuba diver to honor this gift. It is fortunate that in the country’s depths lies and had share of WW II wrecks, not all sites held such piece of history. Our affair in Coron has not ended, other wrecks lie farther (like at Black Island) and it is a reason to be back again. Decalachao Port is for boats heading to Club Paradise in Dimakya Island and El Rio y Mar in San Jose – two exclusive resorts in the area. 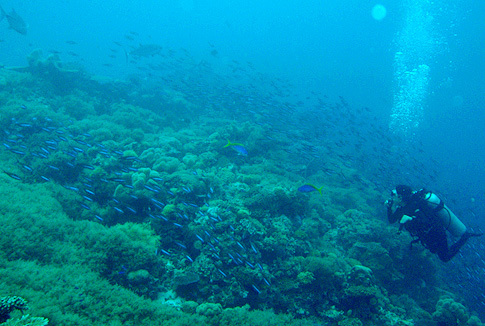 There are two available dive shops in the area – Dugong Dive Center and Club Paradise. During the four-day expedition with maximum of four dives in a day, life become like a series of order – time to wake up and eat, specific time for dives, surface intervals and personal time for rest. Time management is still necessary, you don’t want everybody waiting for you when the chase boat is ready leaving. Weather is unpredictable, in a matter of minutes the waters become choppy. The departure of the three speed boats from HCA is in sequence as scheduled. For safety, all divers in each chase boat shall descend and ascend together – so when we got into the waters on a roll-back entry, with our masks ready and regulators on, DM Wally always said, “On my count – one, two, three!” Splash! And I heard that in all my thirteen dives. 😛 Other buzzwords we had are as pleasing like, “Food is ready!” from the kitchen staff and a sumptuous buffet is before us. Or when the divers got back from the waters, you could almost hear everybody asking, “What did you see?” and what followed are passionate descriptions of the sightings. While Venusians have explored diving and many have excelled, the Martians still dominated it. It’s not for the faint-hearted as they say. So it wasn’t strange that there were only six (Memey & Pia from Manila; Natisha from Canada; Ma’am Nana, Doc Candy and me from Mindanao) of us out of 25 diver guests. I was thrilled with the thought of being one of these special and adventurous people. Diving is never a place for an “ooops”, definitely no errors allowed so following basic rules is purely no-nonsense. Any untoward incident may lead to end the trip, without doubt a total disaster for all of us! We eat at least five times a day, there was such abundance of food complete with dessert – like what about ice cream in the middle of the sea? 🙂 I still have to limit my food intake though. And the dives were such like a buffet – it was my first time to have four descents in a day, really wet! And sleep is almost instant after long day of dives, no such sleeping late like when back home. Rest is all about sleep during the cruise. I believe there’s one thing common to all of us in the boat – pray – everyone was praying for a good weather every day. Because the weather in the area can be so unpredictable, the rains and the waves may come any time. Nobody would want the cruise to be aborted due to bad weather. And we were privileged to have three priests right in our group – Fr. John, Fr. Aldrin and Monsignor Nene – so we didn’t miss the Sunday mass which was being officiated by Fr. John. It was such a deep and solemn celebration. Somehow, with three diving priests with us, there was such an assurance of daily prayers for all our safety. The excitement of getting into the waters and breathing deep down or discovering the unknown are just coating of this incessant aquatic adventures. It’s more about passion of the marine world, the life beyond the depths – just pure love for these creatures, wondering and watching in awe all these wondrous forms of life. I know I’ll never grow tired of my dive quests, the God of the sea never seems to exhaust incredible sights in his kingdom. And as a water person, I promised myself I’ll go on diving until I grow old when my gnarled fingers could still hold and operate gadgets or my wobbly legs could still kick for my fins. Two brave souls dared for this great Tubbataha dream, I know now nothing is ever extreme with one’s aspirations. All I needed was an ardent spirit, determined heart and one good friend who shared same deep passion for the great marine world. It was another living proof that God is ever faithful to His promises! We waited enough for this mission, our ultimate trip away to a paradise not everyone has the opportunity to savor its grandeur. A world away, apart from the maze of crowded cityscape to a place of tranquility. A place where there are no structures but water everywhere, aquatic nature in all its purity. I have written enough about the planning, waiting and seizing our great Tubbataha dream and needless to say that along come with it were the unending thrills and joy as the countdown started. Now, it took me awhile to finally scribble what’s inside me – really how ironic that while my heart and mind was filled with treasured sweet memories from the trip, I don’t want to scribble anything about it – not yet. And just like what Angel said in his SMS after our trip, the memories of our great dives keeps playing in my mind. The headstrong in me pushed me enough to vanish from never ending work even without my approved leave on hand, the thrills had gotten me enough courage to simply digress. The morning horizons when I left Cagayan de Oro promised a sunny day, and I was hoping such would be the condition in the next four days in the Sulu Sea. Though I promised Sir Dodong Uy (our team leader) I would see them at CdeO airport, I haven’t talked to my companions until we reached Puerto Princesa. But I caught up Fr. John Young, SJ at Mactan pre-departure and briefly chat with him until we separated for the boarding. Smiling I said to him, “I made it!” which he immediately corrected, “We made it!” He told me last December when I first met him that it’s been three summers for his Tubbataha attempt. Well, Angel and I only missed one attempt for the Dive Tubbataha 2010 plans. Our team converged at Puerto Princesa airport – Sir Dodong & Ma’am Nana Uy, Fr. John Young, Monsignor Nene Caldoza, Fr. Aldrin Alaan, Sir Jan Surposa, Mark Allen Du – as we wait for Angel whose arrival was 20 minutes later from our Mactan flight. We got back downtown after we checked-in at our yacht for a sumptuous lunch at Ka Lui Resto, at past 1pm everyone was starving. The next morning we were in Sulu Sea purely surrounded with blue waters – Tubbataha at last! I belonged to the Red Group – Sir Dong & Ma’am Nana, Fr. John, Doc Candy, Sir Jan, Mark, and Angel – with DM Wally assigned to us. Day 1. Our first dive schedule was at 9am for a check-out, though most of the divers wanted it sooner as we arrived earlier. Our first descent was at Malayan Wreck not so far away from where HCA moored, though we didn’t get near the wreck but went to a wall covered with gorgonians in variety of colors along with hard and soft corals. 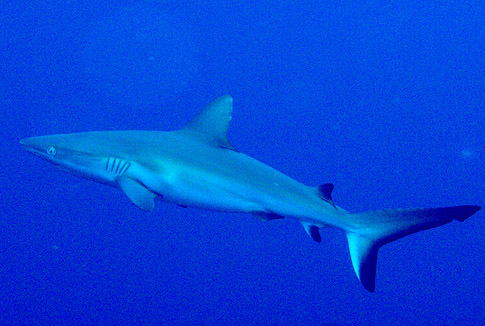 I was most fascinated with sharks – white tips and gray reef – just swimming coyly below us just like any other fish. In a few minutes I was hyperventilating and catching my breath and I wondered, I signaled and DM Wally with Sir Dong was at the rescue. My usual 6 lbs weight was too heavy and so in my succeeding dives I have 4 lbs weight which I found comfortable. We had a dose of sharks in our second and third dive at Wall Street and Amos Rock respectively, plus variety of reef fishes. Our fourth and last dive of the day was bit late already it was almost a night dive, we descend at Ranger Station with our torch. There wasn’t much fish life, they could have taken refuge already in their abodes. We uncovered some dwellers though on rocks and crevices – groupers, snappers and sweet lips. Sea cucumbers were abundant too. Such lovely sightings in our first day. Day 2. Blessed again with good weather, we woke up earlier on our second day as first dive was at 6am. We hope for more good sightings, the sharks have become very common already. Our first descent was at Shark Airport – and true to its name, white tips and gray reefs keep darting now and then! There were sharks again on our second site at Seafan Alley I watch in awe with the abundance of large and thick seafans in variety of colors on the wall. Aside from variety of reef fishes, we sighted turtles – one was feeding on corals and didn’t go away when we watched him and another one we met when we are about to ascend. The day’s highlight was on our third dive, everybody was thrilled. We were floating as we watch the scenery at the Shark Airport, I catch a glimpse of something black coming toward us, at first I didn’t recognize. I got a good view watching the devil ray swimming above us until it disappeared! We went back to Seafan Alley on our last dive – we had sharks again, triggerfishes, more reef fishes plus school of jacks. Two days of diving at North Atoll was just perfect. Day 3. We were up again early for the 6am dive, with the skies somewhat overcast. We had the greatest surprise on that Sunday morning at Delsan Wreck! We didn’t go to the wreck but stayed on the sandy slope with a shallow wall beyond resembling like a bowl. There was some current and swam a bit like waiting, barely 9 minutes after descending I was at 30 meters when there was some commotion. 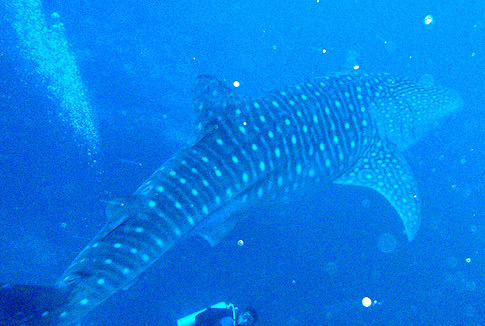 Lo and behold – the whale shark! Everything went fast, everybody was moving fast – I went deeper at 33.8m to get a good view watching in awe underneath. The great whale shark with white tips, gray reefs, tunas and giant trevally swimming with him side by side, and as if giving as a chance to take another look – they circled once more in great display for all of us. The sight was so enthralling! Before we ascend, there was a large school of jacks before as we went shallower. Our next descent was at the Lighthouse which didn’t disappoint us, we went to the wall covered with seafans and variety of corals. We had sharks again- black tips and gray reef, barracuda, blue fin trevally, big morays, jacks, parrots and sea turtle. After our surface interval for our third dive, the waters become choppy so DM Wally advised to defer our dive until the waters will be manageable. We made our last descent for the day past 4pm already, grateful we made it. Black Rock was another wall dive, decorated with seafans, sponges and corals in variety of colors. We sighted triggers, chromis, cardinals, groupers, sweet lips, puffers, wrasses and lot more. It doesn’t matter we only had three descents for the day, the whale shark sighting was more than enough to compensate for it. It was a blessed Sunday indeed at South Atoll…. Day 4. On our last day, our boat went back to North Atoll for the scheduled dives. We had overcast skies again but everyone hoped we could complete the dives. Our boat tender riding on the waves as we went to Malayan Wreck for our first descent, our group agreed to just stay at the wall and had an easy dive. I just observed all the fish and creatures before me as I went through, although everyone’s hoping for another surprise. J There were yellow and black breams, damsels, surgeons, fusiliers, bluefin trevally, triggers, humphead wrasse, moray and of course sharks. The white tip swimming coyly below me just like any ordinary fish. The weather has been down cast and it started to drizzle already. After more than two hours interval we geared for the next dive which was my last descent at the reefs, notifying our DM. My noon flight the next day restricted me to let go of the last dive of the cruise. There wasn’t rain anymore but the waves persisted. We went back to Malayan Wreck determined to make most of my last descent as Fr John urged. We went for the wall observing the fish life there, the visibility still good. There were triggers, breams, trevally, snappers, fusiliers and variety of chromis. After 40 minutes, I slowly ascend for my safety stop to a coral garden watching the reef fishes, then DM Wally signaled for a shark pointing ahead of me – there it was! On a spot of white sands about 6 meters from the surface, there lying flat on the sand a lone gray reef shark almost a meter in size. Lying peacefully asleep on its habitat – what a wonderful sight! Perching behind the corals for few minutes, I watched it in awe J Angel came over and went far by taking a photo – perhaps disturbed by the lights, it quickly swam away. L Though it was time to surface, we still linger in the coral garden until Angel pointed out the wreck just a little ahead of us – how can I be short-sighted! We quickly swam to the spot grateful that there wasn’t current, circled and went around. I was thrilled – I love wrecks! There was lot of dwellers down the wreck – giant groupers, trevally, sweet lips, wrasses, parrots and more – such an active fish life. We managed to take some photos and explored a bit but heard signals to get back to chase boat for the ascent. It started to rain already and the waters getting more choppy. Angel and I was the last as we raced back for the boat, which we can hardly see underwater. We hold unto the boat as it quickly left the spot as the waves getting fiercer. I hold on to Angel’s hand while we’re on the raging waters with the boat moving until he got on, and the stairs was moved for me to climb up. Sometimes you need to be tough to survive certain conditions. Anyway, the small wreck was a fine way to end my quest at the reefs, it was my longest dive during the cruise at 63 minutes. We sped off riding on the waves to take refuge in the yacht. A list of our descents during our recent live aboard trip to the mysterious depths of the Sulu seas, a paradise called Tubbataha Reefs. It was a four-day of “eat, dive, sleep” bustle, obviously the mermaid in me was rejoicing fulfilling this great dream. It was such pure joy to be in the waters, watching breathtaking sights deep down, in silence. Four wet days with thirteen dives in all, in one of stunning dive sites in Asia and one of World Heritage Site in the Philippines. Thirteen amazing dives that marked a highlight in my pursuits as a diver. White tips, gray reef, silver tip Giant manta ray!